Lucy Bee Coconut Flour is a raw, organic gluten free and grain free flour which is created from dried coconut meat. Once the meat has been cold pressed and the oil extracted, what’s left is known as ‘white cake’ and this is then ground to produce a soft, fine flour. Being unrefined and unbleached Lucy Bee`s coconut flour retains its naturally creamy colour and coconut aroma. Being naturally high in fibre, iron and potassium and a good source of calcium makes it a great way to add these nutrients to your diet. The Fair Trade premium for this flour goes back to the coconut farmers to help them increase coconut production; improve their lives through community projects; contributes to a feeding fund for malnourished pupils; life insurance cover for the farmers; and enhance the environment. Use it in everyday foods such as smoothies, pancakes, breads, cakes or stir into porridge. It’s a healthy addition to other flours in recipes and works well in both sweet and savoury dishes. Being high in fibre makes it quite absorbent so we recommend adding an extra egg or liquid, if needed. Store in a clean, dry, airtight container. Keeping this in the fridge or freezer helps retain nutrients. Below are reviews of Lucy Bee Organic Fair Trade Coconut Flour - 500g by bodykind customers. If you have tried this product we'd love to hear what you think so please leave a review. Great price for a good quality product/brand. Would definitely recommend. 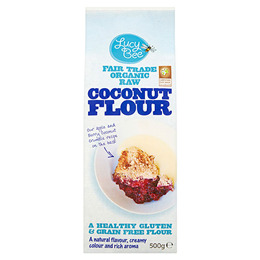 Lucy Bee Coconut Flour is a raw, organic gluten free and grain free flour which is created from dried coconut meat.